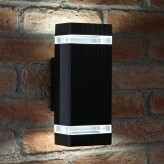 Increase your home security & add a touch of style to your humble abode with this ultra modern up & down wall light by Auraglow. Light is dispersed from both ends of the fitting creating a beautiful lighting effect and is suitable for indoor & outdoor use. The tough aluminium body and glass end diffusers ensure the fitting is able to withstand all weather conditions.